There was never a dull moment on 5 South. As a med-surg nurse, it was one of my most demanding assignments. The unit was comprised of 33 private rooms, and on night shift was staffed by 3 RN’s and 1 nursing assistant. Each night I was extremely busy attending to my 11 patients with the not-at-all-helpful, new-grad-hating, nurses aid. She was supposed to spend a third of her time assisting my patients, but somehow was never around when I needed her. So I ran from 7 p.m to 7 a.m. taking only a few minutes to stop to chart now and then. But one night I would find myself running more than usual. At the beginning of my shift, I went from my sickest patient to the patient who was most stable. When it came time to pop into room 511, I was greeted by a darling elderly man, Mr. Stevens, who had been admitted for congestive heart failure. “Hey, there sweetie, come join me on the porch,” he said in a charming voice. Yep—Just as the night shift had reported, Mr. Stevens was confused. “I’m mighty fine, I was just sitting here thinking about those wonderful tomatoes that you grow. How I would like some of them right now,” he said wistfully. During my assessment, I made sure that Mr. Stevens’ Posey restraint vest was secure. This vest was made of soft fabric and long straps that wrapped around his chest and were then tied to metal bars underneath the bed. The Posey vest would help keep Mr. Stevens safely in bed for the night. After I settled him for the evening, I went off to care for my other patients. It was a busy night, as usual, but every hour or so I made my rounds and spent some time with Mr. Stevens. At 05:30 in the morning, I was sitting alone at the nurse’s station while my colleagues were all attending to their own patients. We rarely saw each other on any given shift, except when we hunted each other down to help each other with tasks such as helping turn a patient in bed, or witness wasting unused narcotics. Head down, pen to paper, I was hurriedly charting when I heard a man’s voice out in the hallway. Quickly jumping up from my chair, I stepped out… and there he stood, Posey vest hanging, patient gown open in the back, flapping in the wind…Mr. Stevens! As he spoke, his entire 6’4” frame swayed forward and backward, and was at serious risk for a fall. Despite his height, he was no hulk of a man—in fact, he was quite frail. I said as I moved in to help steady him. My reach only made things worse, as he jerked back and came extremely close to loosing his balance. “Get my wife!” he shouted, trying to steady himself. But he quickly tipped backwards again, teetering on his heels. Reflexively, I put my hand out again to stop his fall. This time, though, he bobbed forward and swung at me. As I stepped back, Mr. Stevens reached to his right and grabbed my clipboard from the ledge of the window to the nurse’s station. His face was a purple rage now, and it was aimed right at me! “Get away from me!” he bellowed, lunging and swinging the clipboard wildly at me. I stepped back just as he swung the wooden clipboard right at my head, barely missing. I turned on a dime, and started sprinting down the hall like Marion Jones being chased by an Olympic official with a urine collection cup. But Mr. Stevens was in pursuit, not far behind. I felt the clipboard whiz by my ear. Jekyll and Hyde was gaining on me. Just ahead, I saw a door to the utility room that would lead us into an obstacle course I thought I could win. Yanking open the door, I darted in and zigzagged around the supply-filled metal utility racks and out another door at the opposite end of the room. Looking back was not an option, I just ran. The door led to another corridor and once again I found myself at the nurse’s station, but this time at the back entrance. I scurried in. The other nurses were still occupied in their rooms, so I picked up the phone and dialed 9-1-1. “We’ll send someone right away,” they responded and hung up. Looking around for a safe place to hide, I saw a table that would give me a vantage point to all doors. If Mr. Stevens was stalking me, I would be able to see him first and flee in the opposite direction. My breath heavy and my heart racing, I hid for the next two minutes. In the distance I could hear the distinct jingling of brass keys and rapid footsteps. “Officer! Officer! Thank God you’re here! She has a gun!” the demented Mr Stevens sobbed. Since my presence would only further agitate Mr. Stevens, I wisely stayed out of sight. It was sad to think that, through his confusion, this poor man was genuinely concerned for his life. It was no wonder that he was trying to snuff out mine. My charge nurse appeared in the hallway and helped the security guard get my elderly patient back into bed, easing Houdini back into his Posey and adding a couple of soft restraints to his wrists for good measure. There were no more treatments or medications scheduled for Mrs. Stevens that morning, so I continued to observe him closely for the next couple of hours. Peering in, I could see his long, spindly fingers constantly working at the straps and knots, as he plotted his next great escape. Thankfully, aside from the Demerol I administered to Mrs. Lawrence in 516, no one got shot that night. 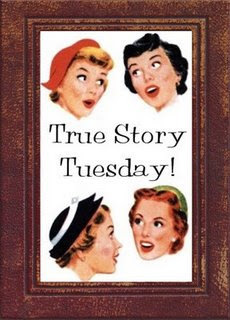 Well that's my true story for True Story Tuesday. 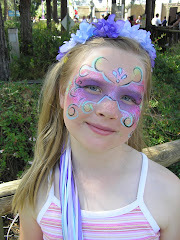 Stop on over at Rachel's blog and join in on the fun by sharing your true story. But a wild-eyed RN coming at you with a big fluffy pillow? Run! Oy... the boys are at it again! Thank you very much - I actually thought to myself in the middle of the post, I sure hope this isn't a "to be continued"! What a crazy story! Glad you weren't hurt - but I was totally laughing at the Marion Jones reference ;) Wicked sense of humor, you! I had a very painful labor patient put me in a headlock one time but never been chased by a patient with a clipboard.What a scary experience. Keep the stories comin. Im trying to get my nerve to share some from my 25yrs of nursing. Havent got up my nerve yet. Awesome story! Wow! You must have been wearing your fast nursing shoes that night. Wow - my heart would have been racing so much! Way to think quick!! You had me clinging to the edge of my seat...what a frightening (and sad) experience that must have been! Thanks for your concern about Ro. Well, thank goodness nobody was shot! Oh wow...that was intense just reading it, I can only imagine what it was like as you experienced it in that moment!!!! I'm sorry for your major scare! But that's so sad about Mr. Stevens. I pray I never get like that. You are such a good story teller. I'm always hooked after the first sentence! That had to have had you adrenaline pumping. I'm glad no one got hurt. That's so crazy that he thought you had a gun. This is hilarious! 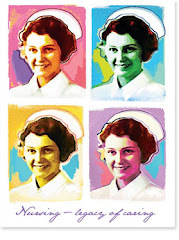 Some days I am so thankfull that I'm a pedi nurse! I found you through McBee's World! What a fun blog!